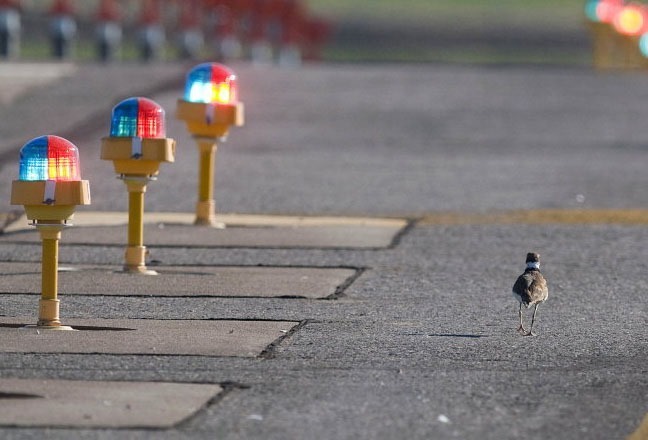 Officially, the FAA is seeking comments by February 28 on its draft Advisory Circular 150/5200-33C, Hazardous Wildlife Attractants On or Near Airports. After reading the 37-page document, here’s a shorter and more concise title, Wildlife NIMBY Airport Guide. 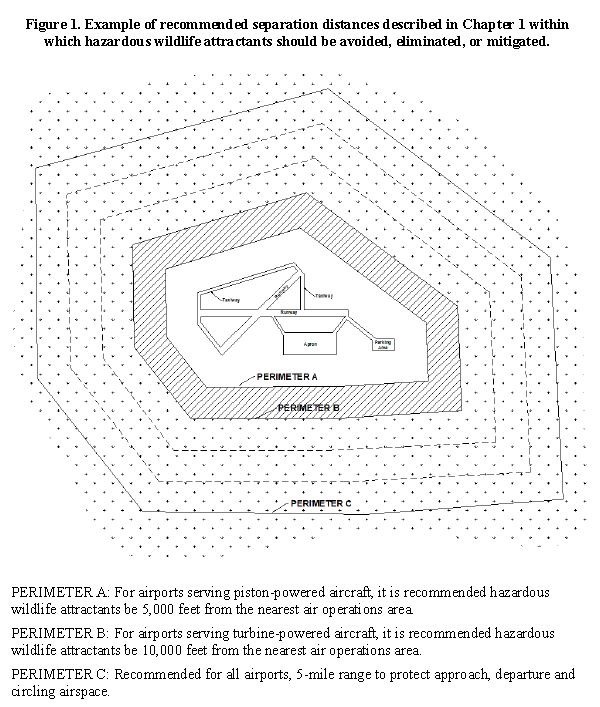 It includes a diagram with the recommended backyard proximity (separation distances) for airports that serve piston aircraft (any airport that does not sell Jet-A) and those that serve turbines. At a piston airport, the minimum separation from any NIMBY wildlife attractant (as discussed in the AC’s second chapter) like a MSWLF (that would be a Municipal Solid Waste Landfill) is 5,000 feet. It’s double that at a turbine airport. 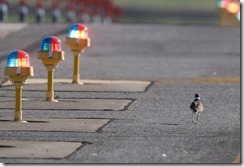 More importantly, it emphasizes that wildlife NIMBY is important to all airports, public or private, GA or commercial. To critters, any airport is open space, a refuge from the sprawling civilization that’s overtaken its habitat. 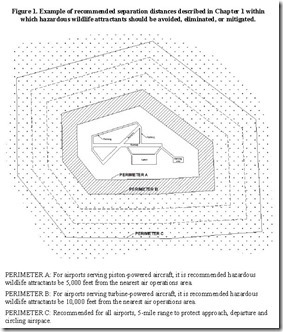 How the airfield is or is not certified and who it serves matters not to them. But it will matter to the human in an airplane that runs into one of them. Another change relates to the damage a critter collision can cause. The FAA moved the table “Ranking of Hazardous Species” to AC 150/5200-32B, Reporting Wildlife Strikes. Every aviator should carry a copy of it in his or her flight bag because it not only explains when and how to make a report, it includes a report form, which is a handy way to record all of the necessary details right after the strike, assuming you’re not on the way to a hospital. The FAA distilled the wildlife table from its database of reported strikes. There are 50 critters on the list, and all of them have at least 100 strike reports. Using these reports, the FAA derived a composite ranking based on damage (unknown, minor, substantial, destroyed), major damage (anything that affected aircraft structural strength, performance, or flight characteristics and would require major repair or component replacement), and strike’s effect on flight (aborted takeoff, engine shutdown, precautionary landing or other negative effect on flight). First on the list is the white-tailed deer, with a mean hazard level of 55 and a relative hazard score of 100. The next four-legged critter on the list is the coyote, No. 12, preceded by birds, include the snow goose, turkey vulture, Canada goose, sandhill crane, bald eagle, mallard, great blue heron, and American coot. More birds separate the coyote from the red fox, tied for No. 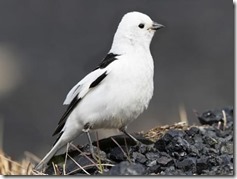 23 with the snow bunting (above). The next four-legged critter is the woodchuck at No. 32. The striped skunk is last on the list. All of its damage scores are zero, but there’s no mention of the lasting aroma. 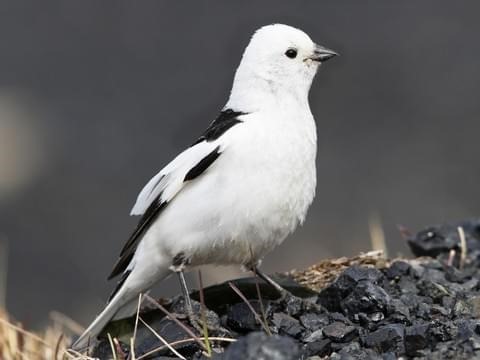 With so many birds on the list, the AC kindly points out that 78 percent of bird strikes occur at 1,000 feet or lower and that 90 percent occur below 3,000 feet above the ground. This entry was posted on Monday, January 28th, 2019 at 8:00 am	and is filed under Airports, FAA, Safety. You can follow any responses to this entry through the RSS 2.0 feed. You can leave a response, or trackback from your own site.